I do like a healthy start to the day, even if things go downhill later on. Green smoothies made with fresh leaves are my favourite. I usually add a banana to sweeten things up a bit, but that’s generally the only fruit I use. However this blueberry kefir smoothie is a fruit smoothie and I wanted the flavour of the blueberries to shine through. I find bananas can muddle the taste sometimes. So, no banana was used in the making of this smoothie. Instead I added an apple for sweetness. There are only six ingredients needed for this blueberry kefir smoothie, although you can add a teaspoon or two of your favourite superfood powders if you like. Just make sure they’re not green ones or you’ll end up with an unappetising brown drink instead of a vibrant purple one. Rose syrup is easy to make and adds a wonderful floral accent to fruit smoothies, bakes and desserts. I use organic milk to make my kefir, but you can use a dairy free alternative or even water kefir if you are vegan or have a dairy intolerance. Find out what kefir is and how to make it by following this link. I used the Optimum Vac2 Air Vacuum Blender to make this blueberry kefir smoothie. It’s a fantastic machine which blends in seconds and has a marvellous vacuum function that helps to keep fruit and veg from oxidising, thus retaining more of their vital nutrients. If you’re interested, you can read all about it in my Optimum Vac2 review. For other recipes using this fab machine take a look at my Full on Froothie page. 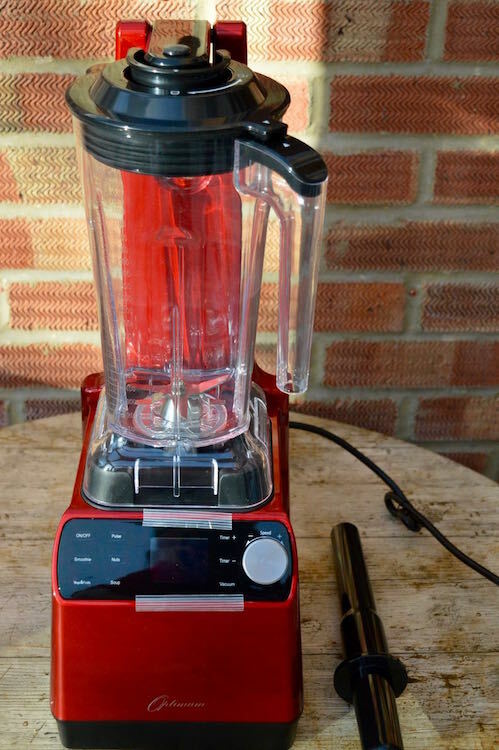 I can also offer you an extra £20 discount from this or any other Froothie Blender. Use the code AMB20 when you order through my link. 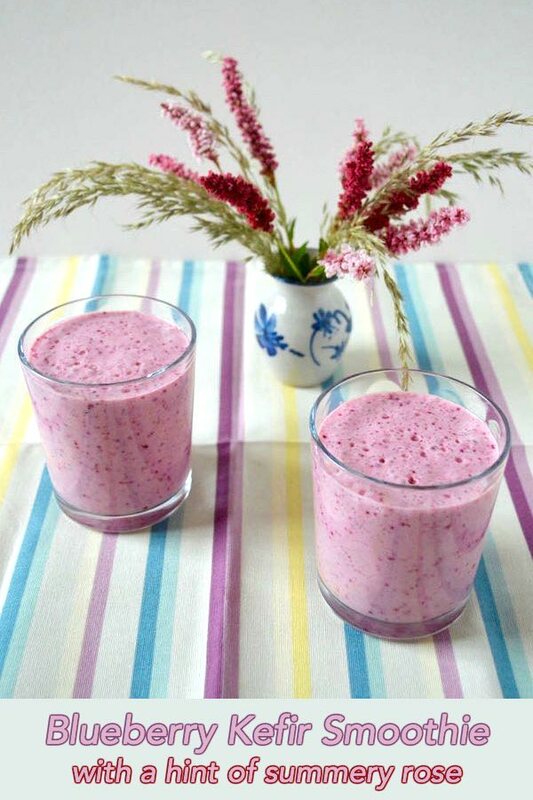 An easy fruity summery smoothie with floral notes. It's both nutritious and delicious. Place all ingredients into a power blender and blitz for around 30 seconds, depending on what blender you're using. For the Optimum Vac2 Air Vacuum Blender, use the vacuum function followed by the smoothie function. Can serve 4 to 8 people, depending on what size glasses you use. Will easily keep for 48 hours in the fridge without separating if the vacuum function is used. If you make this recipe I’d love to hear about it or see a photo. For more nutritious and delicious recipes, follow me on Twitter, Facebook, Instagram or Pinterest. I’m sharing my blueberry kefir smoothie with a hint of rose to the following linkies: #CookBlogShare hosted by Recipes Made Easy and #CookOnceEatTwice hosted by Searching for Spice. Blueberry Kefir Smoothie. PIN IT. Kefir is brilliant stuff. We make it with dairy milk, but I understand it can be made with vegan milks too. I love kefir and this smoothie sounds very healthy and delicious! I love kefir! I’m not often a smoothie drinker, but have found when its been hot its something I crave. Will give it a go! A gorgeous colour! I don’t think I’d ever had a smoothie until I got my first Froothie blender. We used to drink a small glass of kefir neat each morning instead. But I’m now addicted to smoothies, they’re such a good way of getting in a lot of nutrients early in the day. This looks gorgeous – such a beautiful colour. I’ve been planning to eat (drink) more kefir and this looks like a delicious way to do it. We consume most of our kefir in the form of smoothies. It makes it so easy as well as delicious. I just bought a big box of blueberries in the market for loads of kefir smoothies! Oh you found some kefir grains Heidi. I’m so pleased. Kefir is the sort of thing that once you get used to it, you wouldn’t be without it. Thanks Corina. Kefir has become so much a part of our life over the last 20 years, life would seem a bit strange without it now. I’ve only ever tried kefir once (again, in Thailand!) – it was locally-made from coconut water. I wasn’t impressed, TBH. Well, I’ve only every tried milk kefir made with dairy milk and water kefir made with water, so I can’t vouch for a coconut version. But water kefir can be really good (when you get it right), especially in the summer. It creates it’s own natural fizz and you can add ginger or fruit to flavour it.